NAMM 2019: As with all British Drum Company gear, no design and style choices are arbitrary. As such, the new aluminium Aviator snare is influenced by the sleek lines and gleaming metal profiles of classic aircraft. The drum, available in 14”x5.5” and 14”x6.5” sizes, is crafted from a seamless 1.2mm solid aluminium shell - complete with central bead - before being anodised and dressed with gleaming Palladium hardware. The sound is described as “dry and controlled with a sensitive response over a wide dynamic range, inspiring you to articulate your sticking from graceful ghost notes to a full-throated roaring backbeat”. Sound aside, what sets BDC gear apart is the attention to detail, and we love the discrete cherry veneer integrated into the badge. 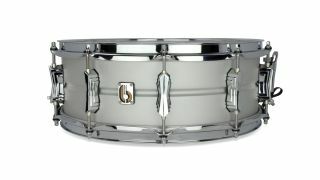 The second of this year’s new snare drums from BDC is The Archer. Sticking firmly to their British roots, this one is handcrafted entirely from English Yew. The snare has been dubbed The Archer because, traditionally, Yew was the preferred timber for making longbows for medieval English archers, thanks to durable flexibility, power and reliability. The Archer is built around a 14”x6” 10-ply shell with 30º round-over bearing edges, which delivers a rich, warm tone with fast attack. As with all BDC drums, the shell was constructed using the company’s unique cold press moulding process. Other features include vintage style mini-claws and Palladium lugs, gold-plated tension rods and a golden badge embellished with green sycamore. Last year BDC delivered the innovative Tomsprings. 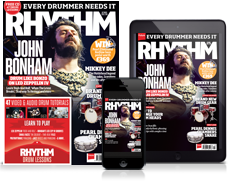 This year, they’ve created another great accessory for drummers, the KickFix. Bass drum creep is a very real affliction universally suffered by drummers. BDC’s solution places a substantial U-shaped anchor in front of each bass drum spur. Velcro strips on the base attach each KickFix to your floor or drum rug and keep your bass drum where you want it. In typical BDC fasion, they look stylish, too.